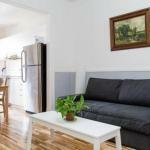 Offering accommodation with free WiFi air conditioning and flat-screen TV Appartements Jean Talon is set 1.5 km from Uniprix Stadium and 4.1 km from University of Montreal -UdeM. The units have a fully equipped kitchen with an oven and a microwave. A toaster and fridge are also available as well as a coffee machine. Mount Royal Park is 4.2 km from the apartment while McGill University is 5 km away. The nearest airport is Montreal-Pierre Elliott Trudeau International Airport 14 km from Appartements Jean Talon.